A Nash County deputy has been recognized for his life-saving compassionate community service. Sgt. Scott Bass was recognized as Deputy of the Year earlier this week by the Nash County Board of Commissioners. Bass has convinced suicidal gunmen to surrender without violence and appeared on national television for helping a woman find a quicker way to work than walking, often in inclement weather. Employed with the county since 2010, Bass has served primarily in the Patrol Division and was promoted to sergeant last year. During the short ceremony to recognize Bass, Chief Deputy Brandon Medina described him as being kind and compassionate with a very generous heart. Bass' heroism and care for the people he serves as a deputy has been repeatedly demonstrated by his actions. In 2017, Bass and other deputies responded to the call of a missing and possibly suicidal person. A high-ranking member of the military, the missing man was located down a secluded path. He was armed. 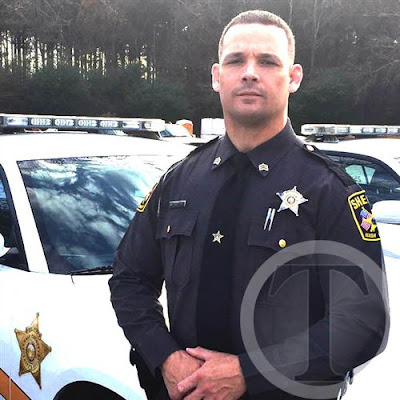 Bass began to reason with the man and ordered the other deputies to fall back, putting himself between a suicidal man with a gun and his fellow law enforcement officers. Another time in 2017, Bass, while in Raleigh attending specialized training, ate lunch with a friend. After leaving the restaurant, Bass was about to pull away in his marked patrol car when a man ran up and said a business was being robbed. "Without hesitation, Sgt. Bass responded to the business and apprehended the suspect, holding him until proper authorities arrived," Medina said. In February, Bass responded to a call for service where he again spoke with a military veteran who was having a hard time coping with life. "Being a veteran himself, Sgt. Bass was empathetic and provided the necessary assistance as soon as he recognized that he was dealing with someone suffering from severe mental distress," Medina said.